COMING SOON — “Perdition” the first book of the Virago series. THANK YOU!!! Readers have spoken! 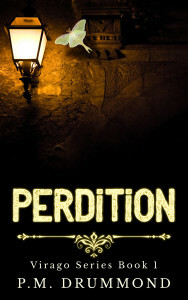 Perdition has been selected for publication on Kindle Scout! The tentative release date is July 12th. A link for pre-orders and for ordering will be posted here as soon as it’s available. Nominate Perdition at KindleScout to be published! Marlee Burns longs in vain to be normal. She’s been telekinetic since birth, but her parents forced her to suppress her abilities and keep them secret. Now that she lives alone for the first time in her life, her power is surging out of control sending things flying all around her. Her mishaps attract the wrong kind of attention. When someone tries to kidnap her, she’s saved by a man with secrets and powers of his own. And she’s far from the strangest.